Our brown calf height non slip socks will fit a 7" to 11" foot. This sock features TERRY CLOTH on the inside bottom portion of the foot of the sock to provide extra padding. 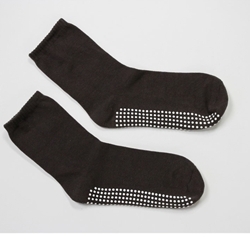 These socks are made of high quality material and are meant for repeated use. Most of the standard hospital socks you will find on the market are meant for short term use and will fall apart after a few weeks of use.